The Dassault nEUROn is an experimental Unmanned Combat Air Vehicle (UCAV) being developed by the French company Dassault Aviation. This delta wing stealth UCAV project is the final phase of the Dassault LOGIDUC 3-step stealth "combat drone" programme. 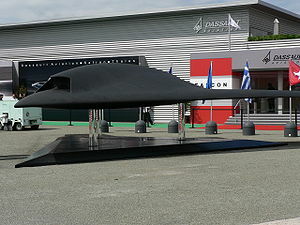 Until June 2005, the UCAV nEUROn design was a full scale evolution of the twin-engine AVE-C Moyen Duc (2001) tactical UAV whose appearance was inspired by the stealth bomber Northrop Grumman B-2 Spirit. The full scale replica unveiled at the Paris Air Show 2005 revealed the original design was revised to a "less ambitious" single-engine delta. The nEUROn development, originally planned by Dassault as "AVE Grand Duc", evolved to a European cooperation including Swedish Saab, Greek EAB, Swiss RUAG Aerospace, Spanish EADS CASA and Italian Alenia. As a "technology demonstrator", a reduced number of units will be produced to explore new operational concepts for a future generation of autonomous stealth fighter aircraft that will be produced in 2020 or 2025. However Dassault plan to primarily use the data collected by the demonstrator to produce derived UCAVs. The French maker states the nEUROn's Adour engine (tuned from the SEPECAT Jaguar) will be replaced in the production version by a more powerful, specific, engine based on Snecma's M88 from the Dassault Rafale. According to the DGA, nEUROn test flights will be proceeded in France, Sweden and Italy in early 2010. As a UCAV, nEUROn will be significantly larger and more advanced than other well-known UAV systems like the MQ-1 Predator, with ranges, payloads and capabilities that approach those of manned fighter aircraft. Although the project is not yet closely defined, illustrations and statements by the consortium partners indicate that the nEUROn is envisioned as a competitive system with the American J-UCAS program's Boeing X-45C or Northrop-Grumman X-47B. Indeed, Saab's February 9, 2006 release notes that nEUROn will be a demonstrator measuring 10 m long by 12 m wide and weighing in at 5 tons. This is roughly the size of a Mirage 2000 fighter. The aircraft will have unmanned autonomous air-to-ground attack capabilities with precision guided munitions, relying on an advanced stealth airframe design to penetrate undetected. Another feature being contemplated is the ability to control squad flight in automatic mode from an advanced fighter like the Rafale or JAS 39 Gripen platform, grouping the nEUROns and controlling the group in a manner similar to many combat real-time strategy computer games. In 1999, Dassault Aviation launched its LOGIDUC stealth UCAV program, which gave birth to the Dassault AVE-D Petit Duc that flew in July 2000 as the first stealth UAV in Europe, and to the Dassault AVE-C Moyen Duc (2001). Dassault changed the third phase name "Grand Duc" - a full scale advanced version of the Moyen Duc - to the more European sounding nEUROn, as the French project was joined by European partners to reduce its development cost. Great Britain didn't join because it was already involved with an American similar program, neither Germany who desisted officially because the country was unable to afford the financial participation. During the 2003 Paris Air Show, French Minister of Defence Mme Michx�le Alliot-Marie announced a major agreement signed between the French groups EADS France, Dassault Aviation and Thales. The agreement covered a joint-venture to "realise a new unmanned military technology that covers all future activity in combat and strategic reconnaissance aeronautics" i.e. LOGIDUC's phase three, "Grand Duc". EADS leads a HALE (High Altitude, Long Endurance) UAV project. Meanwhile, the French defence procurement agency, DGA, acting as the program executive on behalf of the participating countries, has entrusted development of the first nEUROn UCAV demonstrator to Dassault Aviation and its European partners. Sub-contracts have been made with the French industrial firms Thales and EADS France and also with five European firms, Saab (Sweden), EAB (Greece), Alenia (Italy), RUAG Aerospace (Switzerland) and EADS CASA (Spain). Chief project manager Thierry Prunier comes from Dassault Aviation, and the deputy project managers are Mats Ohlson of Saab and Ermanno Bertolina of Alenia. There is a single link between the executive agency (DGA) and the prime contractor (Dassault), and it will be up to the executive agency to coordinate with the government agencies of the participating countries. It will be up to the prime contractor, meanwhile, to coordinate the work with the other industries. Dassault claims 50% of development and is responsible for the standalone LOGIDUC programme. The nEUROn (2010) will be the third Dassault stealth UAV prototype following the AVE-D Petit Duc (2000) & AVE-C Moyen Duc (2004). The nEUROn project replaces the LOGIDUC final phase AVE Grand Duc. Saab claims 25% of development and is also the coordinator for the other Swedish corporations involved. Thanks to the technologies developed for the UAV prototype Sky-x (2003) Alenia Aeronautica claims to is the first industrial partner with 22% share of the entire programme. As of 2010, parts for the aircraft are under are under construction. The contract is valued at €405 million, and allows industry to begin a three-year system definition and design phase with related low-observability studies. This phase will be followed by the development and assembly phase, and by a first flight in 2011. It is planned that the 2-year flight-test program (2010-2012) will entail about 100 sorties, including the launch of a laser-guided bomb tentatively scheduled for 2012. The initial €400 million budget was increased by €5 million in 2006 due to the addition of a modular bomb bay including a designator and a laser-guided bomb. On February 2006, DGA had announced that France will provide €202.5 million, half of the program's €405 million ($480 million) budget, while the remaining funds will be supplied by the other participating member nations. In December 2005, the Swedish defence ministry reported the national share would be €75 million, of which €66 million would be financed by Saab AB. The cost of Spain's participation to the program is estimated at €35.5 million, spread over the 2007-2012 period. Derived production UCAV unit cost is estimated by Dassault to €25 million. Dassault nEUROn Pictures and Dassault nEUROn for Sale.